Home prices are rising quickly across the state and have surpassed their previous peak in many areas, although not all. 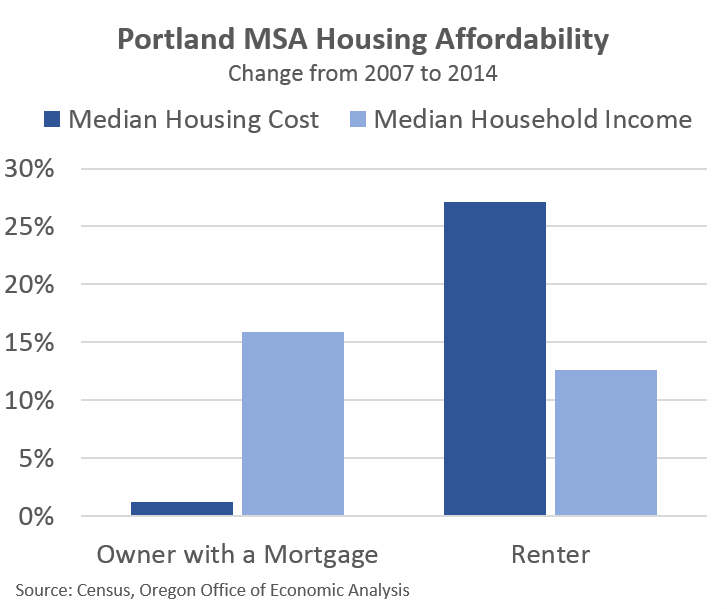 Such prices — particularly in places like Bend and Portland — have many asking the question of whether or not we are in the midst of another housing bubble. The evidence is far from conclusive (I know, I know, most said the same thing a decade ago) but at the least we are currently avoiding the worst aspects of a classic housing bubble, which is truly great news. First, why do I say the bubble evidence is far from conclusive? Yes, prices are all the way back in many places, but so too are jobs and more importantly incomes are much higher in aggregate. Not every household has higher incomes today, but many do. Furthermore, we have a lot more households in the state today — particularly among the higher income brackets — but not enough new construction to keep pace with the demand. The rise in home prices is being driven by an increase in demand and overall lack of supply. This process has pushed prices up, but the underlying reasons are different today. There is much less speculative buying and developing and more importantly lending, in today’s market. It is this last part when it comes to examining mortgage debt that is encouraging. Recent work by the Federal Reserve Bank of San Francisco shows that while national home prices are increasing again, mortgage debt relative to income is not. Below I show an Oregon version of their work. The housing cost measure is the home price to rent ratio, which is a better gauge of any potential bubble than just home prices. In a tight market, both rents and prices are increasing but that is primarily due to the tight market itself, not a bubble**. When sale prices diverge considerably from rents, then it is more indicative of a bubble. The fact that mortgage debt relative to income remains subdued is very good news. When it comes to financial crises, what makes them worse than the typical recession is the large debt burdens. In many historical cases, including the Great Recession, this comes in the form of household debt, mortgages in particular. When the home price bubble bursts, households are left with very high debt burdens for assets (homes) of relatively little value. It makes it challenging to pay off your debt and consumers retrench to try and rebalance their household finances. This clearly has repercussions more broadly, as we saw in the Great Recession when credit markets froze and financial institutions would not lend as no one knew what their assets were worth and whether their counterparts could make good on the liabilities and the like. It goes without saying the economy is better off without financial crises. This is one reason why the SF Fed work above is important to monitor. At least so far, it does not appear that Americans or Oregonians are getting out over their skis in today’s housing market like they did a decade ago. They may do so again in the future, but not yet. * It will be interesting to see what higher interest rates do to the housing market. Obviously it will raise the cost of financing a home, potentially pushing prices down somewhat, or at least slowing their appreciation. At the end of the day, most households care about the size of the monthly payment, not necessarily the sales price in isolation. Interest rates are the interlinking piece here, obviously. 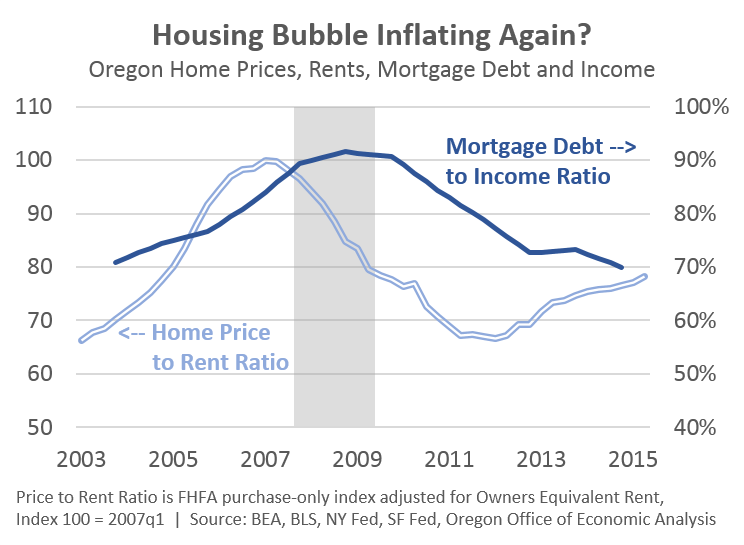 If prices do soften, or even decline a bit, I do not think that is necessarily indicative of a bubble either, given that higher interest rates on a slightly lower sales price results in the same monthly payment for a household. ** High prices by themselves do not a bubble make. However should the market change, prices will too. An increase in supply would soften prices and rents, as would a decrease in demand.